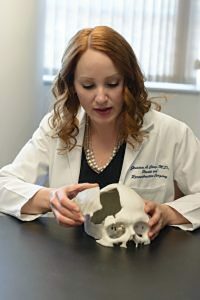 On the ground floor of the Evelyn F. and William L. McKnight Brain Institute, two 3D printers churn out life-sized replicas of patientsí skulls and spines, offering unparalleled practice opportunities to todayís medical residents and even veteran surgeons. Flanked by a surgery resident and a technician, surgeon Jessica Ching, M.D., holds a 3-D model of a patient’s skull. She carefully turns the model over in her hands, considering just where an implant will replace a piece of missing bone. The patient is Robert Lines, 58, of Ocala, who was seriously injured when a gun he was holding accidentally discharged. The implant will cover an area of bone originally removed to relieve pressure on Lines’ brain. Ching, an assistant professor of plastic and reconstructive surgery in the University of Florida College of Medicine, will also rebuild the orbit of Lines’ right eye. Lines underwent emergency surgery and treatment at a trauma center in northwest Pennsylvania, near where the accident occurred. 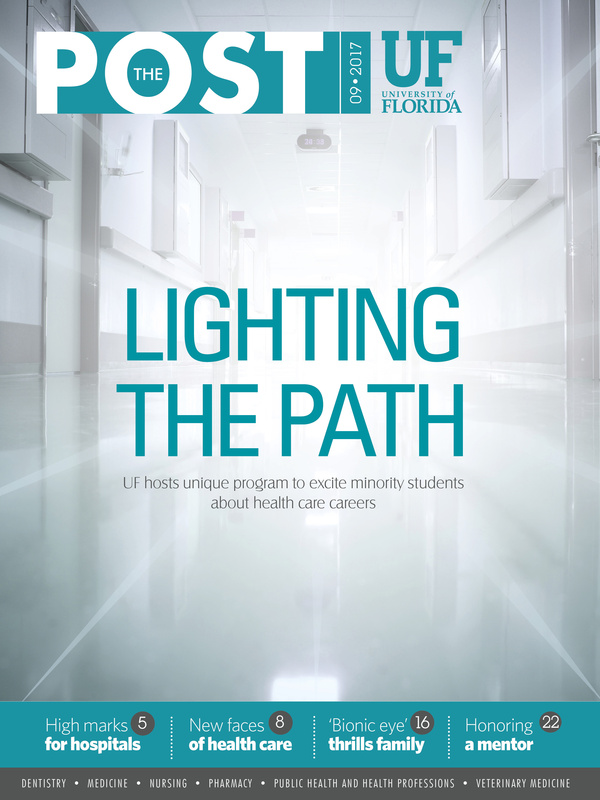 He later returned home and transferred his care to UF Health. Ching and her team continue to examine the model in preparation for a surgery that she will perform the next day in collaboration with UF neurosurgeon Gregory A. Murad, M.D., an associate professor and residency program director with the Lillian S. Wells Department of Neurosurgery. The next day, Lines is asleep on the table in an operating room as Ching prepares to slice through the delicate layers of his scalp to reveal the missing section of bone and damaged eye socket. On another table nearby, Murad creates a custom implant that will cover the gap in Lines’ skull. Ching gently positions the implant above the opening and fastens it in place. She also removes slivers of bone from a preselected portion of the patient’s skull, gingerly positioning them to reconstruct the eye socket. data-gallery Lines’ case is among numerous examples of the use of 3-D printing in health care. Ching regularly collaborates with her counterparts in neurosurgery to treat patients in need of cranial and facial reconstruction. The models, based on CT scans and MRIs, are created on a special printer housed in the Evelyn F. and William L. McKnight Brain Institute of the University of Florida. 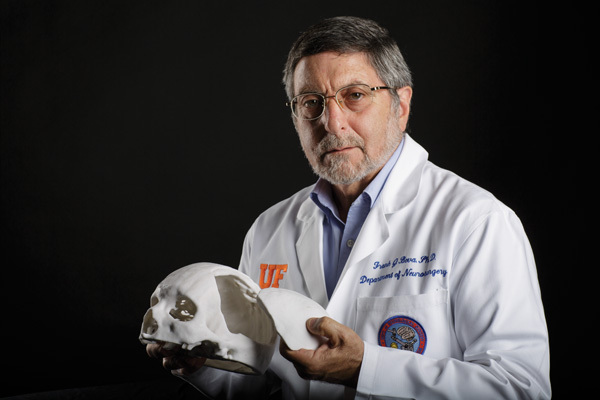 Through a National Institutes of Health grant received by William Friedman, M.D., a professor and chair of the department of neurosurgery, and Frank J. Bova, Ph.D., a medical physicist and director of the RadioSurgery/Biology Lab, UF’s department of neurosurgery purchased its first 3-D printer in 2007. “This is a prime example of bench-to-bedside technology,” Bova said. Before 3-D printing, surgeons would try to make repairs based on a CT scan or MRI. In the case of a patient like Lines, the prosthetic — most likely composed of titanium mesh — would be created in the operating room and continually adjusted to fit. In the case of a more in-depth cranial or facial reconstruction, Ching can use the 3-D model to select where to harvest bone and place the grafts. Bova expects the technology to continue to advance over the next decade. “You’ll be able to pop a disk into your computer, log on to a website, upload the image you need to work on and send the rendering to a 3-D printer on your desktop,” he said.